Quality is a top priority at Rapid Manufacturing, and we constantly benchmark our performance to ensure that we exceed your expectations. We pledge to use experienced and trained personnel, maintain strict quality practices, and utilize the latest in automated, specialized, and calibrated equipment to achieve the highest quality manufacturing processes for our customers. Our overall quality program is based on "ISO 9001, AS9100 & ISO13485" (certified) and is enhanced by other programs that we have adopted over the years that have consistently delivered high quality products. Rapid Manufacturing is UL and CSA approved and can provide certificate tags when required. Rapid has in-house certified instructor for the J-STD-001 and IPC/ WHMA -A-620. Our operators are internally trained and certified to meet the requirements of the standards. Our products are rigorously tested; quality checks are built into the process of production and all finished assemblies are 100% tested and inspected. Functional testing: includes pull test and measurement of crimped contacts and for cables are continuity, insulation, impedance, resistance, and Hi-pot. Each assembly is 100% electrically tested. 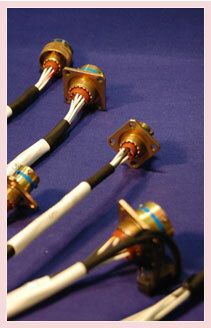 We use only the highest quality test equipment and custom test fixtures for each assembly. Test setups vary in design from simple circuit-completion test lights/buzz to the state-of-the-art computer-controlled testers and multi-circuit stand alone testers with proof of test printout. Test and measuring equipment is calibrated by an outside source traceable to N.I.S.T. Non-Functional testing: visual inspection ensures that each cable or cable harness assembly is to specified workmanship standards and to your specifications. In our 34 years of doing business, we have developed an excellent reputation for producing the highest quality products available by paying very close attention to the details of component manufacturer's assembly instructions. Providing the highest quality and environmental protection to our product and services. Continually improving and to maintain the effectiveness of the quality and environmental management systems. Promoting business objectives and environmental objectives among all our employees. Comply with applicable standards, product safety, regulatory and environmental requirements for our industry.